Ferdinand "Bongbong" Marcos Jr. has the ability to engage or enrage crowds, stir endless debates, and get historians and revisionists discussing. 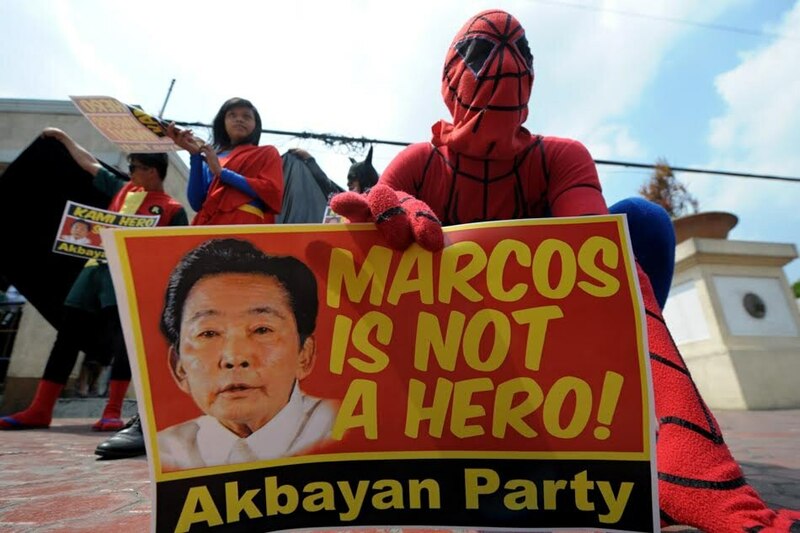 He feels being a Marcos is a blessing, but to his critics, that name is a curse, one that evokes memories of oppression, poverty, and deplorable human rights violations. However, Bongbong's allies are loyal as ever, working double-time to put a Marcos as near as possible to the highest seat in the land. If political surveys are to be believed, Marcos supporters are slowly succeeding. This got #NeverAgain calls to grow louder, and it has revived pains and fear of martial rule. But Whose campaign will the public heed in the 2016 elections? Topics Related to Ferdinand Marcos Jr.
Ferdinand "Bongbong" Marcos Jr. was born on September 3, 1957, to parents Ferdinand and Imelda Romualdez Marcos. At the time, his father was already a lawmaker, representing Ilocos Norte's Second District. 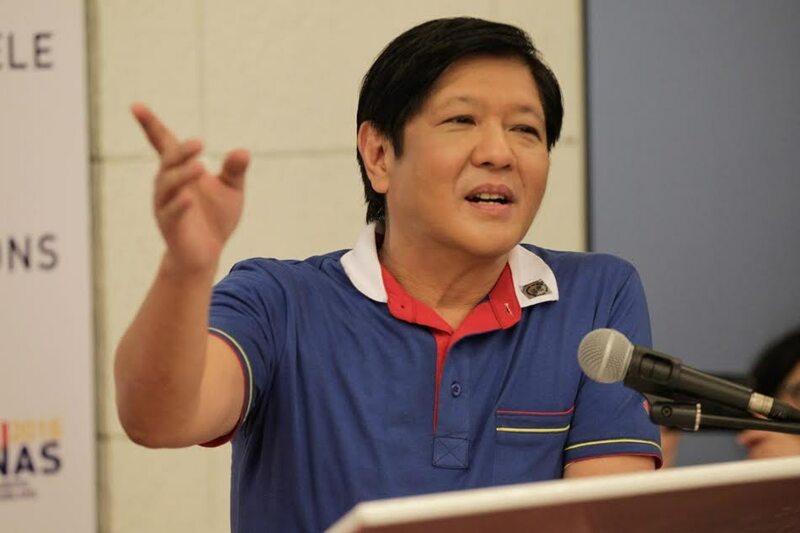 Bongbong spent gradeschool in La Salle Greenhills and moved abroad for his higher education. When Martial Law was declared in the Philippines, Bongbong was in England, pursuing his secondary education in Worth School. In 1978, he acquired a Special Diploma in Social Studies at the Oxford University. Three years later, Bongbong finished a Graduate Coursework in Business Administration at Wharton School of Business, University of Pennsylvania in the US. Bongbong returned to the Philippines and saw himself joining politics. As he grew up, so did his power. At 23, Bongbong was elected Vice Governor of Ilocos Norte (1980), and went on to become the governor the following election. He served until 1986, until they were ousted from power in the 1986 People Power revolution. Bongbong is married to Louise C. Araneta, a founding partner in the Marcos Ochoa Serapio Tan (MOST) Law Firm with her school mates (1981-1985) in Ateneo Law School namely Executive Secretary Paquito Ochoa (on-leave at the firm), Edward S. Serapio (former president Joseph Estrada’s Presidential Assistant for Security Affairs who was jailed for two years, and later acquitted, in connection with the Estrada plunder case) and Joseph C. Tan. Bongbong and his wife have three children: Ferdinand Alexander, Joseph Simon, William Vincent--two of whom have studied in London, just like their dad. Marcos returned to the Philippines in 1991, years after their exile, and shortly before Corazon Aquino ended her presidential term. Bongbong went on to win as Ilocos Norte Representative in 1992; several terms as Ilocos Norte Governor (1998 – 2007); and again as member of the House of Representatives in 2007-2010. In 2010, Marcos ran in the slate of the Nacionalista Party and won a Senate seat, placing 7th overall. He now chairs the Senate Committee on Local Government and the Committee on Public Works. He also chairs the Oversight Committee on ARMM Organic Act. 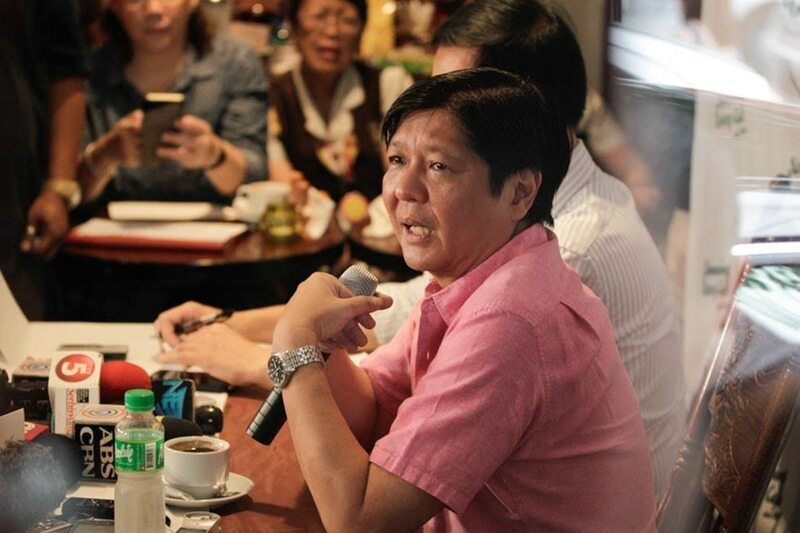 As he established a political career, Bongbong also faced several controversies. Contrary to what was posted on his profile on the Senate website, Marcos did not finish a Bachelor of Arts degree in Philosophy, Politics and Economics in Oxford. A fact-checking done by Rappler revealed that he only obtained a special diploma in Social Studies. Further, it was found out that the Wharton School of Business does not list a Ferdinand Marcos Jr. among its graduates for the MBA program, contrary to what he claimed in his resume. His profile has been corrected since. 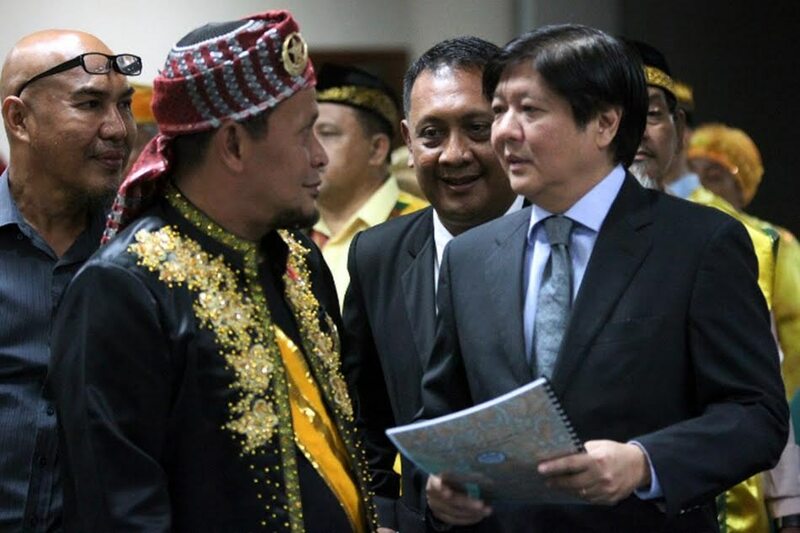 Marcos, who heads the Senate committee on local government tackling the BBL, earlier rejected the draft Bangsamoro Basic Law, citing that its provisions might reduce the sovereign authority of the national government. Marcos said several provisions of the BBL run counter to the Constitution, such as the provision for a parliamentary form of government within a presidential form of government, and the imposition of limitations on the power of Congress. He introduced his own version in the Senate in August 2015. In the latest Pulse Asia survey for vice presidential preference in December 2015, Marcos rose to the 2nd spot from the 3rd spot in the September 2015 survey. Marcos’ performance in Pulse Asia surveys has been on an upward trend since June 2014. Aside from vice presidential frontrunners Grace Poe and Chiz Escudero, Marcos is the only VP bet to register a double-digit national voter preference. Likewise, Marcos’s survey ranking and rating in SWS is consistently rising since June 2015. In the latest SWS survey conducted on December 12-14, 2015, Marcos’s ranking jumped to 2nd-3rd place from 4th-5th place in the September 2015 survey. His ratings drastically went up from seven percent in September 2015 to 19 percent in the latest survey. Senator Bongbong Marcos authored 52 bills in the 16th Congress (2013-Present), with one bill eventually being enacted into law (SB 1186). The bill later on became Republic Act 10632 which is about the postponement of the 2013 Sangguniang Kabataan (SK) Elections. In the 15th Congress (2010-2013), Marcos authored 32 bills, with seven of them being enacted into law. These were the Anti-Drunk and Drugged Driving Act, the Cybercrime Prevention Act, and the National Health Insurance Act. During his stint as Ilocos Norte Representative (14th Congress), he authored three bills, one of which was his version of the Archipelagic Baselines Law. On his first term at the Lower House, Marcos authored 29 bills. Some of these led to the creation of National Youth Commission and Department of Energy. Bongbong Marcos is an advocate of environmental protection and preservation. He has filed bills relating to this advocacy such as the Climate Change Act of 2011 (SB No. 2885), the Philippine Green Building Act (SB No. 410), Bicycle Commuters Incentives Act of 2013 (SB No. 413), and an act Regulating the Use of Plastic Bags. He also supports advocacies on education, agriculture, tourism, cooperatives, energy, housing, OFWs and local governance. 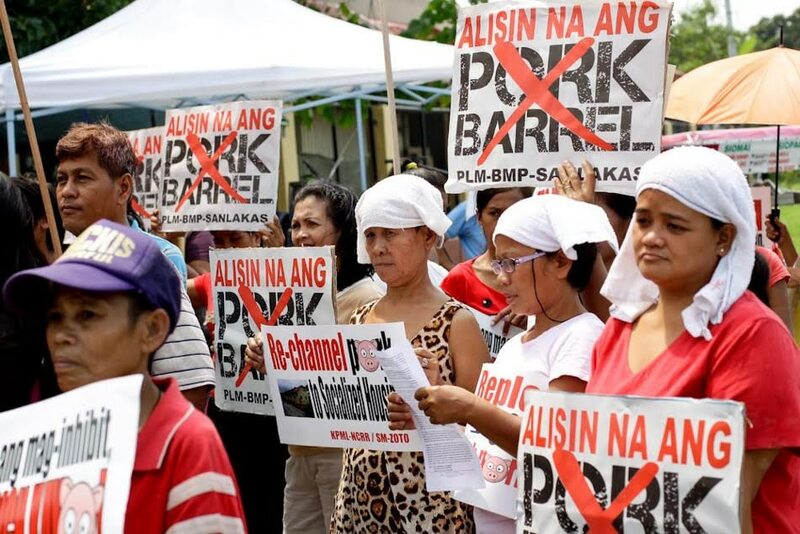 In 2012, Marcos backed the protest of tobacco farmers to eliminate taxes in their products.